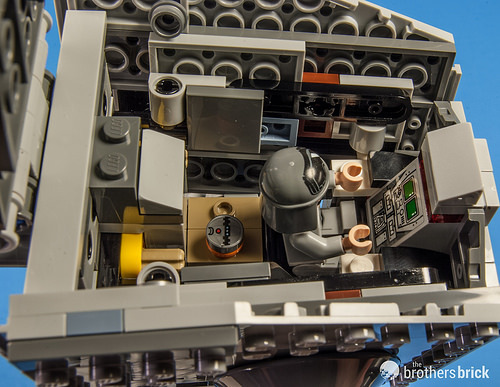 Back in October, LEGO released its first batch of LEGO Star Wars sets from Rogue One without a whole lot of fanfare. We’ll be reviewing those sets around the movie’s release in just a couple of weeks, but one of the sets stands on its own without reference to its place in the forthcoming film — the new 75153 AT-ST Walker is the same vehicle seen throughout the Classic Trilogy, and it’s currently 20% off from Amazon (that’s $31.99). 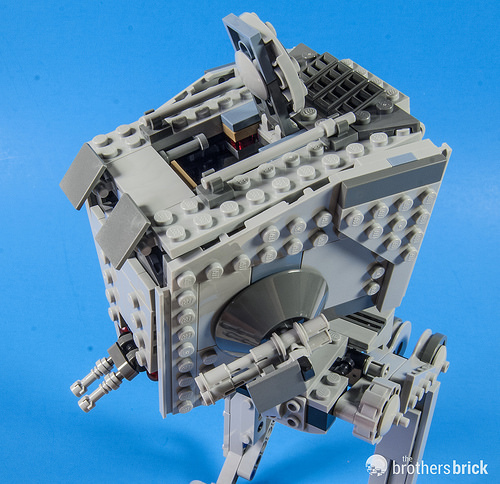 75153 AT-ST Walker includes 449 pieces with 3 minifigs and retails for $40. The set comes in three numbered bags, with a single instruction booklet spanning 161 steps. 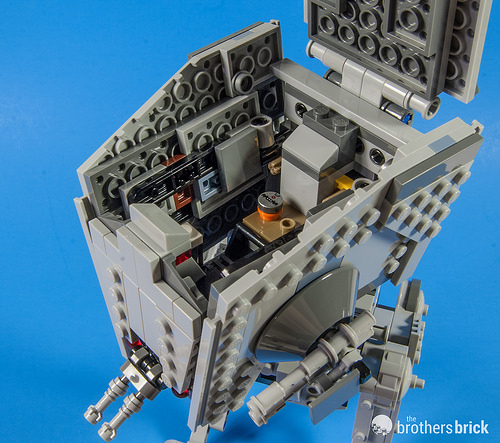 You build the base of the AT-ST’s main hull first, and it becomes immediately evident that there’s going to be some interesting functionality in the finished model. 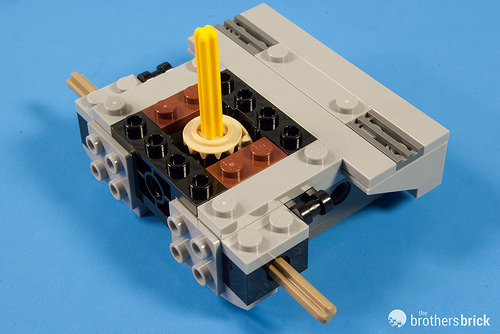 The base incorporates gears that turn a vertical Technic axle, whose purpose will be become evident later (or is already obvious to experienced builders). The rest of the walker’s body includes some pretty serious and sometimes complex SNOT, with structural reinforcement from more Technic. 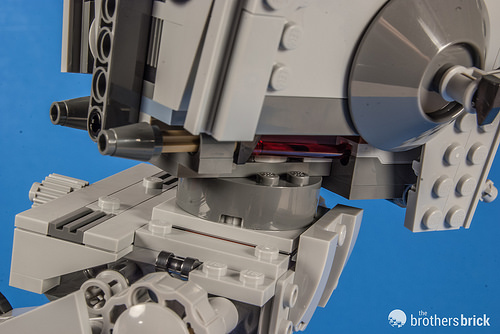 The sides of the AT-ST’s hull lean in just like the real thing, hanging off of Technic pins and hooks (in contrast to the clips that held the sides at an angle on the smaller AT-ST in 8038 Battle of Endor ). 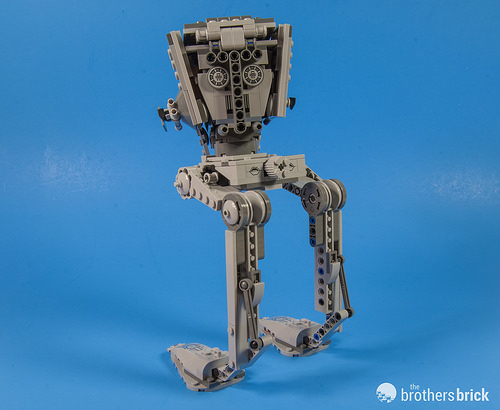 For a $40 set, this is a substantial AT-ST, with some solidity and heft to it, and it towers over minifigs at 9″ (24 cm) tall. The legs can be posed independently, and the hull can swing side to side. The top hatch opens, of course, and the roof has some nice details — not just a big plate with a trapdoor. One disappointment is that the larger hull (compared to earlier minifig-scale AT-STs at least) doesn’t accommodate two minifigs side by side — you won’t be putting your Chewie and ewok minifigs side by side so they can mount a surprise rescue of their hapless human and droid comrades. Then again, minifigs have notoriously wide hips, so perhaps it’s unavoidable at a realistic scale like this. Those gears we built into the base of the hull connect to a knob on the back that turns the hull, which is a pretty awesome play feature. Naturally, the set includes flick-fire missiles, launched with hidden pins in the back. And I have to say that I continue to be impressed with how LEGO designers have begun incorporating the flick-fire missile launchers better into the completed sets (like Joker’s lowrider). 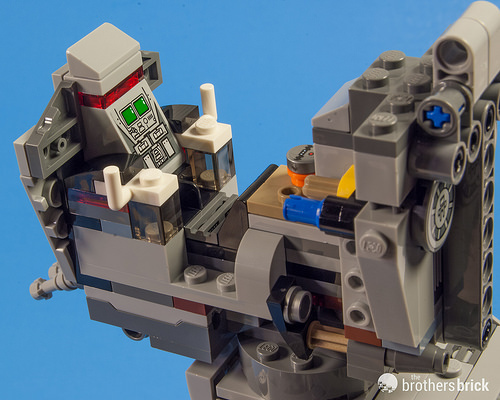 Overall, this is a very well-designed LEGO AT-ST, with well-integrated play features. I know other reviewers have pointed out that it’s a bit big — and admittedly it’s actually a little taller than it should be at this scale. Nevertheless, the greater parts count and larger size enables great shaping and detail. The set includes an updated AT-ST driver with a printed helmet, along with two Rebel characters from Rogue One. Each has detailed torso and leg printing. But most importantly, I really like that there’s only one “light flesh” minifig in this set — the LEGO world needs more diversity. 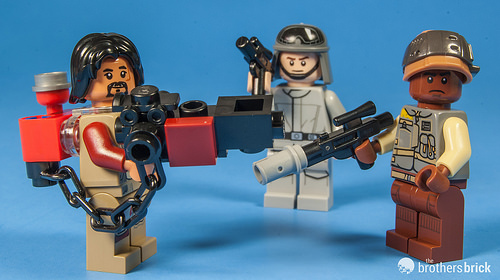 The Baze Malbus character has a large brick-built thingamabob, but it remains to be seen what the accessory does, or how accurate it is compared to its presumed appearance in the movie. 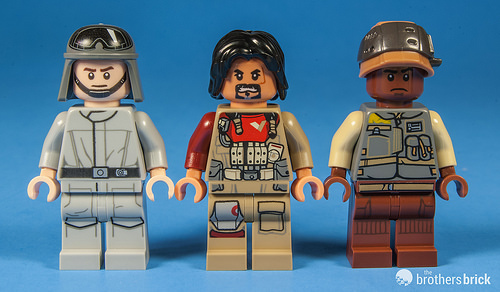 I particularly like the Rebel trooper, who has a two-color overmolded helmet and technical-looking torso print. 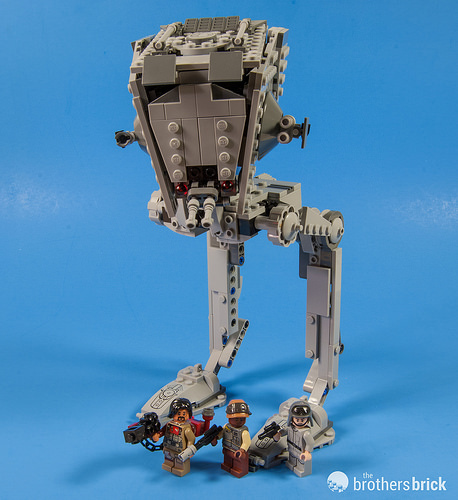 Scale issues aside, and ignoring the accuracy of the minifigs until the movie comes out, this is an excellent LEGO AT-ST. From a value standpoint, it’s a $40 LEGO Star Wars set with three minifigs and 449 pieces, which is actually rather unprecedented (and I believe I may have mentioned once or twice already that it’s currently $31.99). 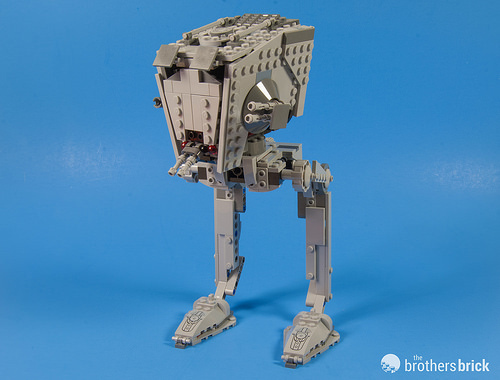 This is probably my favorite AT-ST set of the innumerable versions LEGO has released since the rather sad first one from 2001. I definitely recommend it, both as a display model and for the fairly generous parts count. 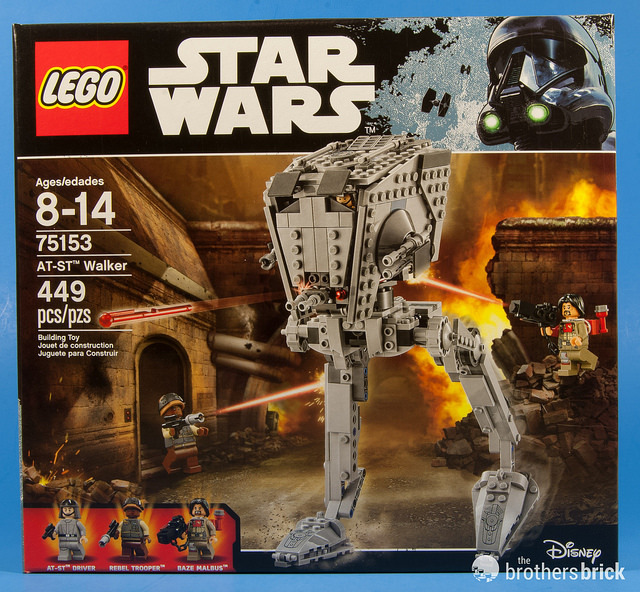 75153 AT-ST Walker is available now, discounted at $31.99 from Amazon and full MSRP of $39.99 from LEGO Shop online. Nobody sent us this LEGO set for free. We just like it.